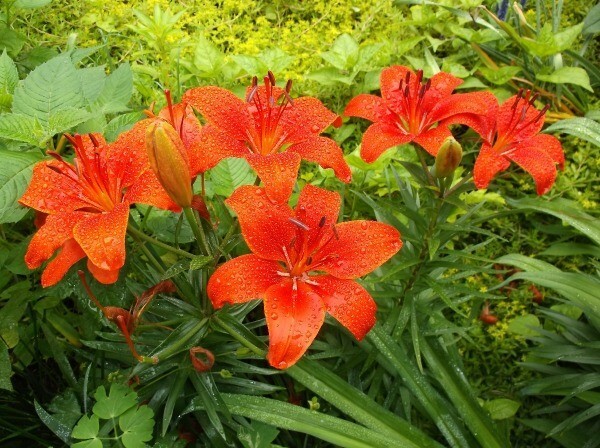 There are so many beautiful lilies that you can plant to grace your garden, adding color and sometimes heady fragrance. This is a guide about growing lilies. Bulbs generally available during the spring or fall. If you're buying bulbs in the fall, make sure you get them in the ground before it freezes so they have time to establish some roots. Plant bulbs from 6 to 9 inches deep (smaller bulbs slightly closer to the surface). They tend to be voracious eaters and will appreciate a little 5-10-5 fertilizer or wood ash worked into the soil around their clumps. The scaly structure of lily bulbs puts them at a great risk for root rot so sites having heavy clay soils need to be amended or avoided. New plants will produce flowers in 2 to 4 years. In the fall, mulch bulbs well in zones with harsh winters. 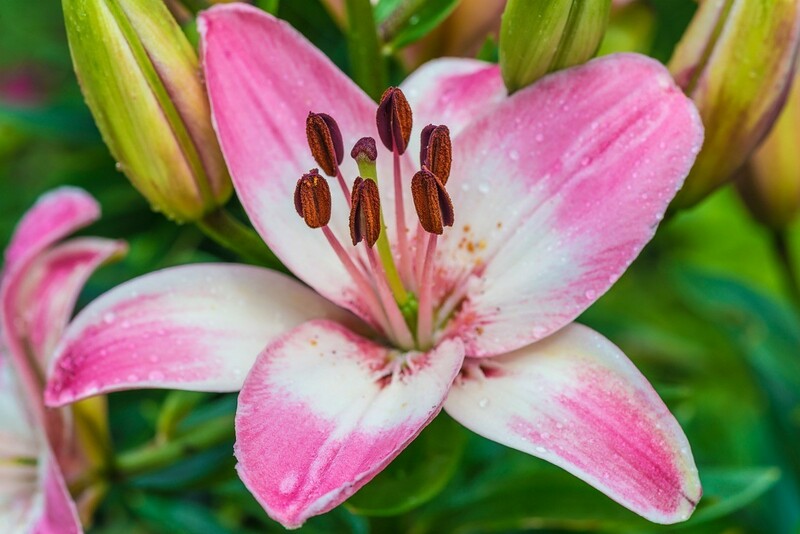 The easiest way to propagate lilies is to dig them up and remove the offsets that form around the base of the main clumps. These can be cleaned up and replanted in the garden or in pots. Plant them at a depth of twice their height. Lily bulbs never really go dormant. If you purchase them or order them through the mail, plan on planting them quickly. If you can't keep them in the refrigerator (or at 40ºF) until you can get them in the ground. What do you do with lilies when they stop flowering? Assuming you mean stop flowering for the season (versus stop all together), leave them in place because the stalk helps transfer nutrients from the sun down to the bulb. Only remove the stalk when it has browned. You can always plant a nice groundcover at the base so you have a cleaner look after the flowers fall off. I just leave my dry stems in the plants/gardens to mark where they will be for next year or till you garden clean up and can locate them. My lilies and peppers and cherry/pear tomatoes share the same garden and flourish greatly since we stuck them there. Something must come from the one that gives to the other. They are both fantastic. Some lilies bloom only once and then die down. These are called day lilies. Others like the stella d'oro types will continue to bloom provided you pick off the dead flowers. In each case let them die down. You can clip the very dry plant material if you find it unsightly. Good luck. When in doubt check with a nursery, or fellow gardner. I am looking for information about how to grow lilies. Lilies are very easy to grow. 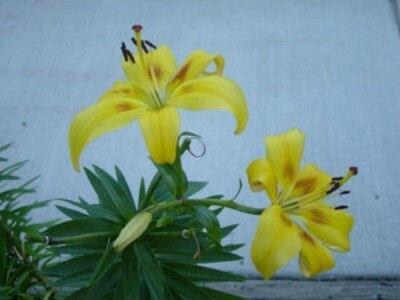 I have several kind, naturalizing lilies, day lilies and Asiatic lilies. They like partial sun, well drained soil. They come up year after year and multiply. I don't do anything after I plant them except put stakes beside the large Asiatic lilies to keep them standing. Only bad thing, bunnies like to eat them so I fence mine. The Lily Nook has a lot of lilies and ship them all over the world. 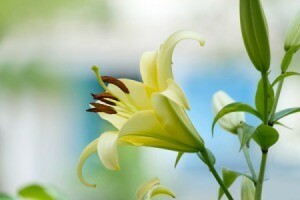 They also have a great website that has many pictures of the lilies that they carry and a lot of articles. This is the address of the page with all the articles. It should answer your question on planting and growing lilies. I have some lily plants that have bloomed. They are in an area that I would like to stop watering as I am making that area a little/no water area. I will be moving the plants this fall after they die out. Will there be any harm to the plants by not watering now? I would say you don't need to water them, but do not deprive them either. The plant remains green after it has bloomed because that is what replenishes the bulb for next year. My lilies' leaves are turning brown and the flowers have brown spots on them. Do you know why? Lily Thrips (Liothrips vaneeckei) can cause brown spots on the blooms. You can try using an insecticide that is effective against thrips. What could cause my Tiger Lily to not bloom? I have read about shocking it with a spade plunged into the soil about 1 ft away from it, but that didn't help. It is not so large that it needs to be divided. In the spring as the stem of the lily was close to coming out of the ground, if the lily was stepped on by yourself or an animal...like often happens around here as my 2 dogs run through the flowerbeds, the top of the lily will not produce buds. It will have a distorted top or just a top that seems to just end...just will have leaves to the top of the stem. The bulb will be fine and will actually probably be even bigger because all its energy will go into the bulb instead of producing flowers. Protect the lily with a little fence or mark it somehow for next year. I wouldn't shock it with a spade. You will disturb the roots and some lilies, for example martegons, need to be left undisturbed for a few years before you will even get the first flowers on them. My lilies are flowering good, but have a brown sap in the lily's flower. These Commander in Chief liliums bloomed the last of June through early July. 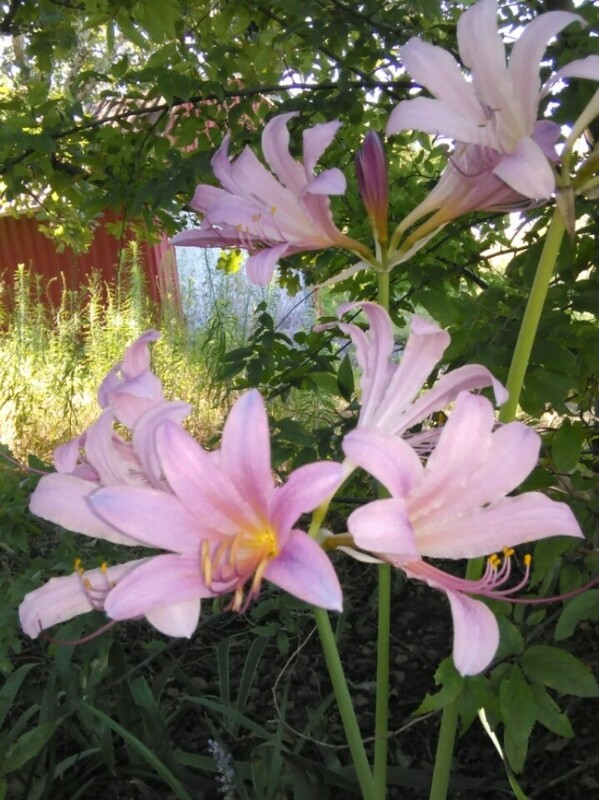 These lilies get about 2 feet high and are very easy to care for. This photo was taken after a rain shower. The drops on the lilies make them look even prettier! In my garden in Missouri. Lily bulbs have overlapping layers, similar to an artichoke, known as scales. If removed and placed in a soil-less medium they will produce new bulblets. 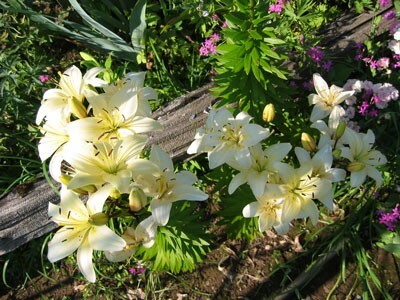 Scaling is an inexpensive way to increase the number of lilies in your garden. This is a guide about propagating lilies from scales. 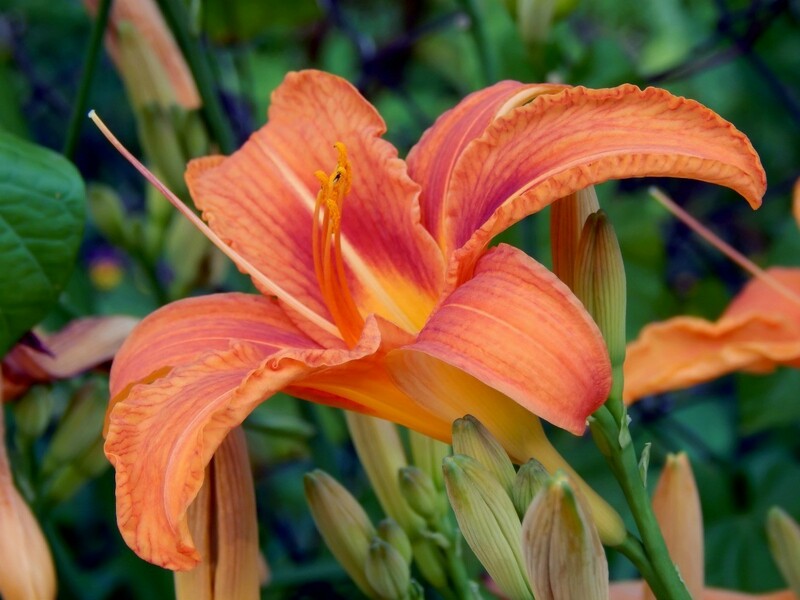 There are so many varieties of lilies that can be planted in your garden you can often have blooms from spring to fall. This page contains lily photos. 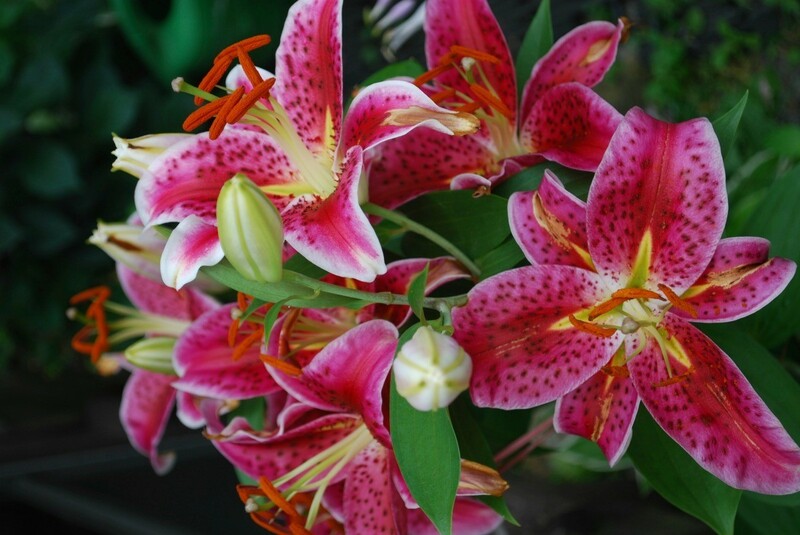 This guide is about growing stargazer lilies. These hearty, fragrant flowers are quite easily grown from hybrid bulbs. Lilies are easy to grow, being relatively disease and pest free. They like moderate to hot weather and lots of sunshine. They can grow in partial shade if they have 4 to 6 hours of sunshine every day. They are very hardy and will grow just about anywhere in any type of soil, but will benefit if you add some type of fertilizer. Lilies also love water. You should give them at least 1 inch of water a week, or a good soaking every three days. Lilies will be one of the hardiest perennials in your garden. I agree that daylilies are easy to grow. I have over 100 different kinds of daylilies in my yard with more, I'm sure, in years to come. They are reliable bloomers (as long as the deer do not eat off the buds on the scape). What you are seeing on the lily stem are called bulblets. Some lilies have lots of bulblets. These are little seeds of the lily. If they drop on the ground, most will overwinter and you will have many more lilies in years to come. If you like the lily and want more, then let them, the bulblets, ripen and fall off, cover with a little soil and leave them.